In the main towns, Waingapu, Melolo, Waikabubak, and Waitabula, there are now ATM machines. With credit cards or debit cards you can get cash 24 hours a day. European Cashpool or Vpay cards work at least only in Bali. BNI and Mandiri give you most. Be cautious with BRI and NTT banks. It often happens that either a transaction is not possible or even the card is disabled by Visa or MasterCard after an attempted transaction. Before leaving one of the bigger towns it is important to change these bills into smaller denominations as there is little or no change in the villages. In Sumba, the day begins with sunrise after 5 o’clock; this is due to the time zones that are more aligned with the central region of Indonesia. After sunset, about 17 o’clock, one can only hope that there is enough fuel for generators and people use electricity sparingly. In the evening you should always carry a flashlight. After 10pm the day is over. Because of the widespread introduction of solar power lights, generators are put on less often. For your electric equipment you need a charger with a USB plug now. These plugs fit into solar installations. AAA batteries are seldom available in Sumba. On Sunday, more than a quarter of the population of Sumba is in church, shops are closed, and you get nothing. In addition to the Indonesian calling code +62 the code for landlines is 0387. So the total code is +62387. In many villages there were satellite phone stations, especially in areas without mobile phone reception. They are gradually dying out because cell phone reception has improved and everyone has a cell phone. The blue signs Telkomsel +- km means meanwhile mostly that there should be the best cell phone reception. The Simpati or Kartu As card in the version "Area Bali Nusra" is the only mobile phone network that has a relatively good coverage in Sumba. All other networks do not work. In remote areas, in the mountains, and especially in the south also the Kartu As fails. Tip: try to ring up at night or different types of weather. Or ask locals for a "pohon telekomunikasi / tempat telekomunikasi"
The connectivity of smartphones is even poorer. Actually they work only near the cities or telephone masts. Therefore you should download maps and information before. You should fill up your mobile phone Pulsa in town, because you can only get tiny Pulsa denominations in the country. Please buy Pulsa Hp Biasa, Pulsa Hp Internet, and no Pulsa Listrik - this is for electricity. In many sub-districts of Sumba, there are local internet centres (Pusat layanan internet kecamatan). You recognize them by the blue signs with a globe and magnifying glass. Normally such a sign does not mean that the technology is actually already in place and functioning. Meanwhile they are also dying out. In Waingapu there is a public WiFi place near the old harbour at the Telekomunikasi office. In Waikabubak there is a public WiFi place at the telephone mast. In Waitabula there is an internet station in the Kolping House opposite the cathedral, and maybe still that one next to the Sinar Tambolaka Hotel. Things are changing rapidly. In major hotels and restaurants, there might be already WiFi. Please look at yourself, where you get "WiFi Koneksi". Letters I sent from Sumba to Germany always arrived - vice versa not always. A registered letter raises the chance of arriving. If you want to write to people in the country, you should ask for an address in town as there is no reliable postal delivery available in the country. When you see many people waiting in the Kantor Pos, it is probably due to salary and pension payday, and then you should just come back next day. You get Malaria every few years – that is what I've often heard in Sumba. CRM and DTG recommend permanent malaria medication. Malarone or Atovaquon are the standard medication. It is reimbursed by some health insurance companies (in Germany). In some countries cheaper competing products with the same ingredients are available such as Malaprotec. On the Internet and in Asia Malarone is offered but it is often faked. If you take Malarone over an extended period, it may reduce the number of red blood cells, other side effects are described in the instructions ... You should never take Malarone for more than 4 weeks. The cheaper alternative is Doxycyclin. This drug may have the unfortunate side effect that you become sensitive to sunlight. Since January 2013, the new malaria medicine Eurartesim is available. It does not only cure people but also acts against the resistance of pathogens. So you get cured without affecting other people. But it has also significant side effects and is therefore not recommended by CRM. Shamans and development workers in Sumba swear on Sambiloto (Latin: Andrographis Paniculata) a medicinal herb that is also applied clinically. In PUSKESMAS health centres in Sumba malaria can be diagnosed quickly. They treat it with a Sambiloto-like Chinese medicine. My recommendation: take Doxycyclin permanently if you can stand it and keep malaria rapid tests and Malarone for emergency cases. Dengue Fever: There is currently no medicine against it. 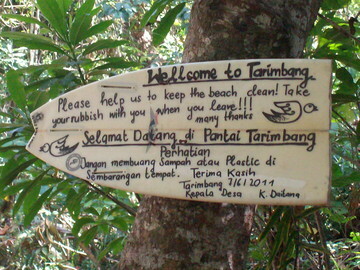 Especially in Bali and now also in Sumba is a drastic increase of the diseases to be recorded. The "Asian Tiger Mosquito" can transmit the disease. They prefer puddles of water in plastic waste, car tires and dumps. You can recognize the mosquitoes by their exceptional size and black and white striped body and legs. Dengue fever mostly it occurs as an epidemic around monsoon time, especially in the southwest. At 95%, the disease process is similar to influenza. At 5%, there is a critical clinical disease process, and untreated it can lead to death. A secondary infection leads to considerably more critical courses. There are 4 variants of the dengue fever, each leads to immunity against the respective pathogen. As a precaution foreigners are often sent for treatment to Bali. You can detect dengue fever with a simple self-test: constrict your upper arm for 5 minutes, than open and look in the elbow - if red spots appear, it is 90% dengue (From: Stefan Loose Travel Guide). While the malaria mosquitoes bite only at night, dengue mosquitoes bite around the clock. You have mosquitoes not only during monsoon season, but also in dry season especially near mangrove areas, stagnant water, trash, and irrigation systems. You should not only rely on the efficacy of drugs, but first above all, spray with a mosquito repellent. Antibrumm-Forte and Nobite were the best in test. In open accommodation you must sleep with a mosquito net. Don't just bring the net, but also enough rope to fix it to somewhere. Head lice are everywhere in the country. However, not every woman who dealt with the hair of another does it because of head lice. Mostly she is only plucking grey hair. At night a silk sleeping bag with a cover around the pillow provides protection against head lice. Sand fleas are annoying especially at beaches, near brackish water, and river mouths. Leeches are common in wet jungle areas in Sumba. They fall off as soon as they get in contact with some mosquito spray which they do not like. Those who travel in such a remote area must be aware that there may be little help in emergencies. You have to take care of yourself. When you see locals sitting on roofs of buses without being able to hold tight, you have to realize that we "Orang Bule" apparently do have a different understanding of security. From this aspect questions according safety purposes have to be put into perspective. There are many stray dogs that might have rabies and may bite. It is therefore quite common to arm yourself with a stick. There are wild boars in mountains and forests in the south. Therefore make frequent stops and look for droppings and trampled ground. Snakes are rarer than elsewhere in Southeast Asia. By the way, they live not only on the ground. They usually flee if they sense steps in their habitat. The green snakes are deadly poisonous. In the dry areas there are pythons, but they are not so big, that they are dangerous for adults. Crocodiles are often found as sculptures on megalithic tombs. So they do exist! They live in freshwater wetlands and especially in non-fast flowing rivers all around Sumba. They can be up to 6 meters long. I mentioned specific information on risk areas in the text. Accidents happen apparently mainly if you disturb the habitat of the crocodiles. But large specimens do also attack people spontaneously. The most recent reports of accidents were related to people who were fishing, doing seaweed cultivation, harvesting water spinach, and washing at the riverside. The rumours that Australian sea crocodiles (alligators) stay in Sumba is not proven. However, I have photos showing crocodiles that are in no way inferior in size to Australian sea crocodiles! Anyway, you should not bathe near estuaries and mangrove areas. You should cross rivers only at a clear point. Anyone who has concerns, please research on the Internet under the search word "Buaya Sumba". Ask locals if the area is safe before venturing into the water! I've heard nothing about crime against tourists. Tourists are rare and sometimes behave differently to what people of Sumba are used to. This is often a cause of misunderstanding. As a guest it is important to develop a sense of what you may do and may not do - especially concerning the Marapu faith. Things which we bring with us, and which are known from advertising in television, surely arouse certain desires. Perhaps we should leave things with famous brand names at home. And as I described above the term property is sometimes defined differently than with us. People in East Sumba say that there is much more crime in West Sumba. At least the tone among the people and with foreigners sounds less friendly, sometimes perhaps too direct, which is interpreted as aggressive. This is especially true for Kodi, the poorest district of the island. Among themselves they are still very aggressive. The age of head-hunting is over less than 100 years. As I said before, there are still ethnic clashes. People burn down houses of the neighbouring district, steal cattle and commit murder. On the personal level there are often motives like envy, jealousy, and pride. An "accident" at a Tarik Batu ceremony in Pau in 1958, where about 50 people were killed, is still unclear. Some people steal gold and valuables from funerary objects in megalithic tombs. Supposedly there are Balinese in Sumba who open graves with car jacks and winches. It is a rumour, that rich Balinese instigate people from Sumba to steal to order, mainly megalithic statues. (cf. theft because of bride price under Social Structures and chapter History). Diving and Snorkelling: The only dive centre in Sumba is in the noble Nihiwatu resort. They dive at the south coast. You can snorkel at different places: In the north and northwest of Sumba the underwater world is not really interesting. Along the east coast, during calm weather and near beaches are many smaller snorkelling areas (Kambera, Nusa, Benda, Kalala, ...). Unfortunately, the increasing of seaweed cultivation makes the water dull and fishes move away. In the south the waves are usually too high. However, if the sea is relatively quiet from November to April, the south coast is quite attractive. The marine population is not nearly as varied as in Alor, Flores, and Sulawesi but also different and very colourful. You have to be aware of dangers of waves and currents - there is no speedboat that comes to help you. Surfing and kite surfing: You have excellent websites describing the particular spots, better than I can and want. Outside the in the text mentioned places and times there are no surfers there and appropriate accommodations are mostly empty. Fishing: More and more Indonesians do "puncing" = fishing. Especially from Waingapu or the fishing villages in the East they rent boats for fishing. So just ask locals whether somebody takes you along. Bicycle: ... is only possible with mountain bikes on side roads, some dare to undergo such Tortures. Indonesians are beginning to discover mountain biking as a sport. Birdwatchers: ... will find interesting observation places also outside the known areas. In the main street of Waibakul (Jalan Raja Wairasa) there is an information center of "Burung Indonesia". Cave Carvers: Anywhere in Sumba there are limestone caves. Most are unexplored. Only those which are easily accessible are used by locals. Near Lombu are caves where early humans lived. Caves near Kodi often contain drinking water. There are water-solar projects through which this water is conducted to villages. My personal experience is that it does not depend on the name of an organization, with which you do a tour, but on the experience of your guide. Sumba is small, everyone knows someone who has special information, where something is just going on. Take your guides or your drivers in duty, say what you want to see, otherwise they show you what the mainstream tourist always gets to see. To accompany tourists is a job that brings a lot of money but also many opportunities for both sides.